When I first started my blog almost 8 months ago not many people in my life knew about it. Besides my husband, I pretty much kept it a secret from everyone. The aqua polish on the left is the best ever... a post on it will come in the near future. Why? It was really because of a fear of being judged for my obsession with what some may call frivolous and material things. I didn't want people to know that I went to 3 different countries and 6 different cities to track down the Naked Palette! Then it dawned on me... my IQ doesn't decrease with every new lipstick purchase... my wallet, yes, my IQ I'm pretty sure is still intact. Except maybe when I get obsessed about a particular product and that's all I can think of until finally get them... yes Tipsy & Dollface, I am talking about you! 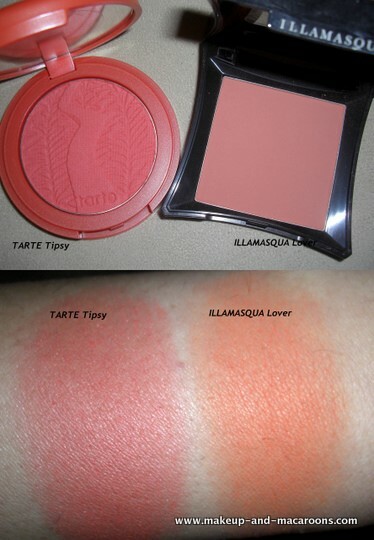 Or when I start talking in legal-ese trying to justify why I got a Lover, Illamasqua Lover that is. I'm happily married thank you very much! The point I'm trying to make is, that while I kept thinking that I have to keep my blog a secret because I'll be judged, thought of as materialistic or not smart enough, that wasn't the case at all. People are either going to think it's fabulous (and you're fabulous!) or just not care and that's just fine! There are still people in my life that don't know I have a blog, but that's because I haven't seen the need to tell them, rather than being afraid to tell them. So for all you bloggers out there - who knows about your blog? You may remember my recent Flormar haul which included 3 new nailpolish purchases. The lovely Vita from Making Up 4 My Age requested a swatch of Supermatte #111 (the dark brown one) first but over the course of last week I tried all 3 polishes, and here they are. I really like the colour of this in the bottle, a lovely pale pinky peach, and to tell you the truth I was expecting a more cream finish. Instead it's frosted formula which is my least liked formulas for polishes. My nails aren't that smooth and buffed, so frosted polishes just look very streaky on my nails. In the picture below I'm wearing 3 coats of the polish and even though it looks quite opaque, you can see the streakiness on my ring finger. Because I'm not a fan of the frost, I only left this on for one day before removing it so I can't comment on the lasting power, however even with the 3 coats this polish was dry within the hour which is great. Aah, this is a stunning colour that I do love. It's a beautiful bright coral with specks of gold in it... my camera wasn't able to capture the lovely gold flecks but trust me they're there! I got a great opaque coverage in 2 coats and this lasted me 3 days before I removed it to try the next colour. When I bought this polish I didn't realise it was meant to be matte, but luckily for me this wasn't didn't have the supermatte look that I was dreading. It was more of a creamy look, with minimal shine. In the picture below I'm wearing a shiny top coat over it. The picture in the collage in the first pic is how it looks without the top coat. Only 2 coats are needed to get an opaque finish, but unfortunately after 2 days this chipped around the edges. Overall I really like the creamy formulas, but not a fan of the frost one. These cost $5.99 each, which is very cheap by Australian makeup standards, and if I can brave the overwhelming choice of nailpolish colours again at Flormar, I will most likely get some more. And don't forget, if you're in Sydney region I have a discount code that you can use to get 15% off Flormar until 31 July 2011. HERE is the post where I've got the code and details. 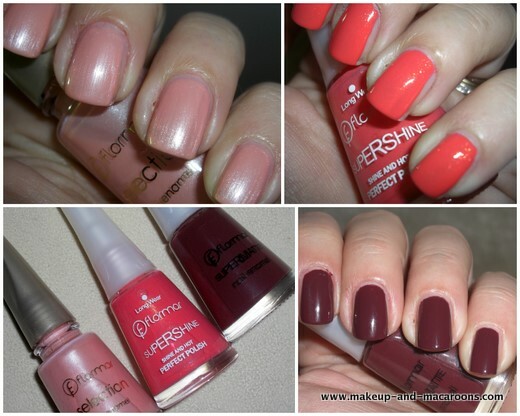 Have you tried Flormar polishes before? What do you think of these colours? Remember when I bought my Tarte Amazonian Clay Blushes (reviewed HERE) I mentioned that there was one other item I purchased? 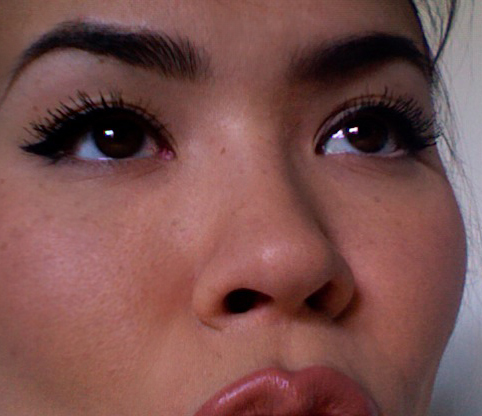 Well my dears, it was Dogon eyeshadow by NARS. NARS Dogon is a limited edition shade and I will be honest here... when it first arrived in the mail and I took it out, it looked nothing special. Just some beige/taupe and a chalky looking charcoal. Then I swatched it... and magic happened. NARS Dogon - the picture doesn't capture how beautiful the colours are. The beige/taupe turned into a metallic taupe with duochrome shimmer. It's very hard to photograph and capture the effect on film. The dark shade is still a fairly matte charcoal, but it pairs perfectly with the taupe. 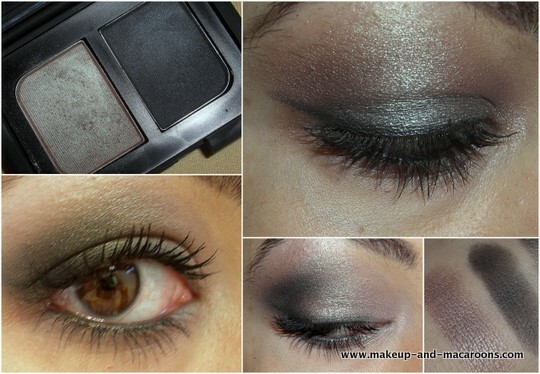 Blended together you get a steel grey shade with duochrome shimmer. The two colours paired together are perfect for a dark smokey eye. And you can also wear just the shimmery taupe on it's own for a neutral eye with a difference but I prefer it worn together with the dark colour in the outer V to give some definition. 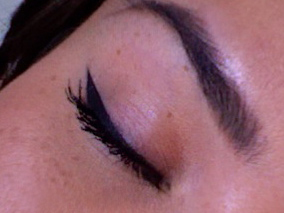 I also use the dark shade to line my eyes instead of using a liner. This is my first eyeshadow from NARS, and the reason I didn't jump on the bandwagon earlier? Price! Readers from outside Australia might be shocked to hear how much this very same eyeshadow retails for here.... $72AUD (or $78US or 54 Euro or 48GBP) when in the US it's actually around $33, yes, less than half the price it sells for here at the shops. I bought mine from a really reputable ebay seller called M-A-C Lover for $35 when I bought my Tarte blushes, so the combined postage was $6.99. As you can see even with the postage buying online for me was definitely cheaper than buying from the stores here. Have you got any NARS eyeshadows? What do you think of the crazy inflated prices here in Australia? Last week I along with a few other bloggers was invited by the lovely Nicole from SLA Cosmetics and Nicslife blog to their Makeup Studio at Sydney's Balmain to introduce us to SLA cosmetics and celebrate Bastille Day with afternoon tea and scones. I'd never heard of SLA before so I was excited to get to know this brand. SLA was created by makeup artist "Serge Louis Alvarez" in the early 1980s, and it's produced, manufactured and marketed from their head office in the south of France. 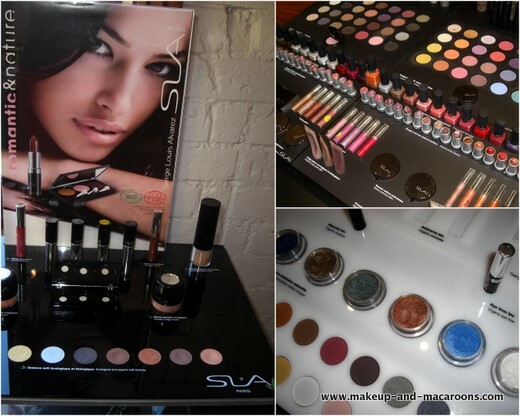 SLA is a professional range of makeup sold in salons and pharmacies. For stockist details in Australia click HERE. 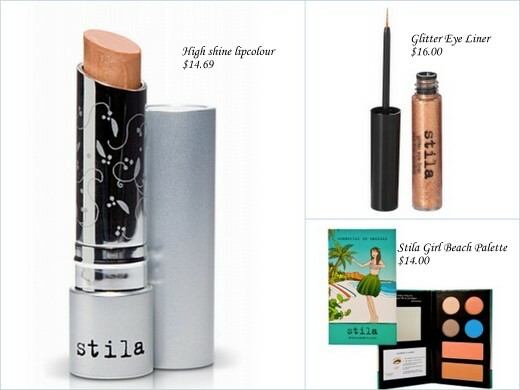 There is a full range of products available, from foundations and powders, to eyeshadows, lipsticks, and nailpolishes. I wanted to buy EVERYTHING and take them home with me. The main purpose of our visit to the studios was to get introduced to their brand new range of Organic makeup which is ECOCERT certified by the French government. The whole collection has been formulated without parabens and where possible all active ingredients have been sourced from Fair Trade. Above is just some of the range of the Organic makeup, which also included crushed pearl loose pigments which somehow I forgot to photograph! Duh. 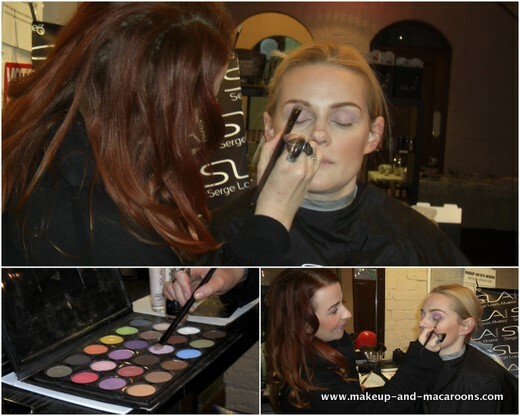 Hannah, the lovely makeup artist at SLA, gave Nicole a makeover using the SLA range. "When applying your eyeshadows, the lighter the colour the bigger the brush." We were then sent home with goody bags containing a french manicure kit, a lipgloss from the new Organic range and false eyelashes. As for the gorgeous pink lipstick below? I couldn't help myself, I fell in love with the colour so I bought it right there and then! I will do a proper review of these products when I've had a chance to play with them. To read more about SLA click HERE, and to see Mez's blog post about this event click HERE. Have you heard of this brand before? Do you love discovering new brands? Dinner with mum. Skinny Cappuccinos. Too Faced Romantic Eye Palette. Tali doing a guest post on Blushingloves. Taupe nails (again). Planning an island holiday. Lipglosses. High heel boots. Tan handbags. Pink blushes. Reading trashy novels. Straight hair. Lush Lemony Flutter. High tea. Husband being away for work. Cold weather in Sydney. Favourite bloggers stopping blogging. Work. Naked Palette (too cold to think of golden shimmery shadows). Lipsticks. Black handbags. Next public holiday being in October. Peach blushes. People who vaguebook. Frizzy hair masquerading as curly hair. Rain. Amanda Seyfried is someone I've had a beauty crush on for a while... another person I have no hope of looking like! Remember the last crush? Amanda is an actress from Mamma Mia, Letters to Juliet and Big Love. Tell you the truth I don't think I've seen any of her movies... actually I lie, I've seen Letters to Juliet on the airplane some time ago. This reminds me, don't you love long flights sometimes, as you can catch up on any trashy movies on the in-flight entertainment that you secretly wanted to see but did not want to admit to. Anyway... back to Amanda... regardless of her acting skills, I love her wide eyed look with her gorgeous green eyes, and to die for hair. If I was to be born again as a blonde non-Armenian, I'd like to look like her. Thank you. That is all. And here is this week's BFF Link Love. Tammerly from Pink Diva Beauty shares her top ten must-have foundations with you. Which have you tried? Angie from An Obsession With the Fabulous can't stop raving about her ultimate lipsticks Tom Ford Private Blend Lip Colour. Monique at Mon-Amie is so impressed with Limecrime lipstick and its long-wearing formula. After putting it to the test, Mon-Amie has one to giveaway. (Here's my link!) 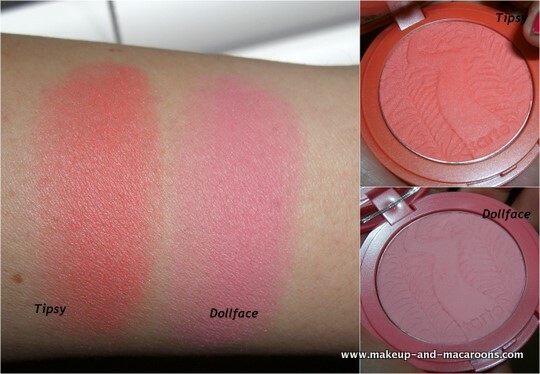 If you're looking for a super bright pink blush to give you doll-like cheeks, NARS Desire may be it. 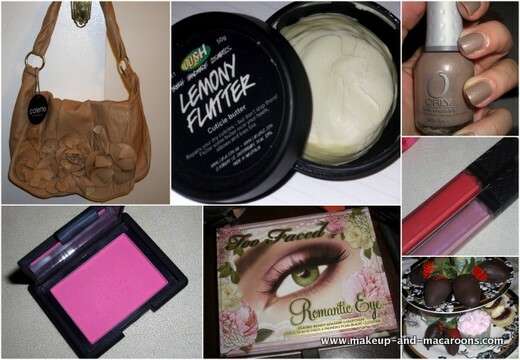 Check out Lilit's review and swatches on Makeup and Macaroons. Want to have gorgeous wavy curls this winter? Here's the chance to win the very much raved about Modiva Professional 25mm Curling Iron on Through Beauty Eyes. Dr Naomi at Beauty is the Promise of Happiness explains how we can make our ears look younger! 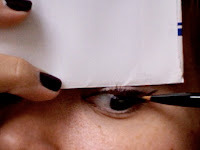 Maryam was kind enough to agree to my request to do a How To post on achieving the purrfect cat eye (pun intended!). Over to you Maryam. 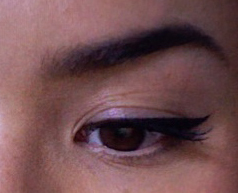 Forget what you've heard about the Cat Eye, I'm here to set the record straight--Cat eyeliner flatters every single eye shape and is extremely wearable. This look is great for beginners and masters alike and can be as simple or as dramatic as your heart desires. 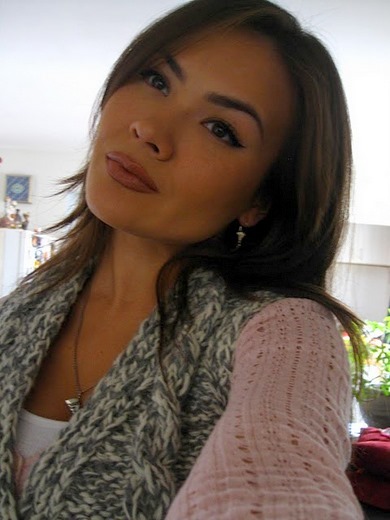 It also happens to be my go-to makeup look for every day and is my favorite easy "glam-me-up". So, if you haven't already tried it, I will walk you through it and together we shall embrace the power of the meow!!! 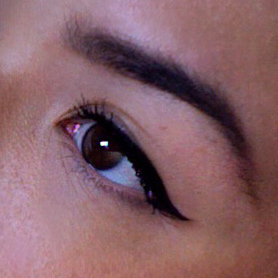 Without further adieu, I present to you the Cat-eye, purrfect for every day-school, work, play, whatever. Enjoy!!! Thank you Maryam for your wonderful step by step instructions! I hope everyone found the instructions helpful, I know I did! And if you haven't yet checked out Maryam's blog, what are you waiting for? 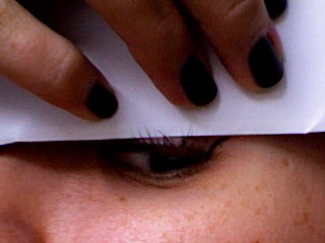 Have you mastered the cat eye?